American orbital launch vehicle. NASA Marshall design for a cargo version of the shuttle system. The shuttle orbiter would be replaced by an unmanned recoverable main engine pod. The same concept was studied earlier as the Interim Heavy Lift Launch Vehicle (IHLLV) and as the Class I Shuttle Derived Vehicle (SDV). 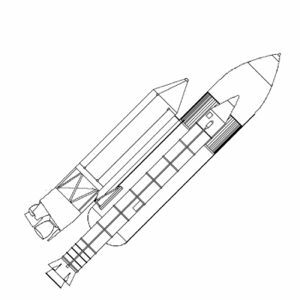 The Phase I two-SSME configuration would have a payload of 45,000 kg to low earth orbit. Design carried to an advanced phase in 1987-1990, but then abandoned when it was found the concept had no cost advantage over existing expendable launch vehicles. Status: Study 1989. Payload: 77,000 kg (169,000 lb). Thrust: 20,299.20 kN (4,563,442 lbf). Gross mass: 1,966,675 kg (4,335,776 lb). Height: 56.00 m (183.00 ft). Diameter: 8.70 m (28.50 ft). Apogee: 400 km (240 mi). A throwaway orbiter with no wings, crew cabin, or avionics, and only two engines. This idea was abandoned early. Class I Shuttle Derived Vehicle as had been proposed in studies of the 1970's. The Class I SDV was again found to be the best solution. It was estimated it could deliver payload to orbit at a cost of $4400/kg, as opposed to $1720 for the Delta II, $ 1800 for the Titan IV, or $ 3400 for the shuttle. 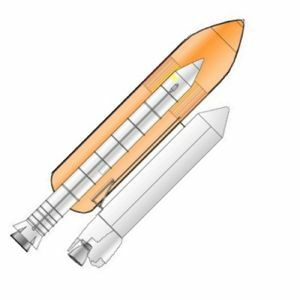 As a result a Request for Proposal was issued for the Expendable Cargo Element - a payload fairing for the Shuttle-C to be mounted on the side of the external tank. This could accommodate 4.6 m x 22 m payloads weighing up to 47,000 kg and would be delivered into a 407 km / 28.5 deg orbit for docking with Space Station Freedom. The system could also deliver 52,000 kg to a 300 km / 28.5 deg orbit. The CE (Cargo Element) was equipped with 2 Space Shuttle Main Engines, and 2 Orbital Maneuvering System pods. The payload would either be released attached to the planned Orbital Maneuvering Vehicle transfer stage, or an OMV already in orbit would dock with the CE and take the payload away; or the OMS itself would be used to put the payload in its final orbit, release it, then retrofire to return the CE to earth. In February 1988 the industrial team Rockwell - Martin Marietta - Boeing - Teledyne - Intermetrics - United Space Boosters was awarded follow-on18-month study contract NAS8-37144. During the course of the study NASA canceled the OMV, and the design had to be modified to handle in-orbit delivery and release of the payloads. The final report of the study envisioned two generations of Shuttle-C's. Generation 1 would be an expendable CE with a 4.6 m x 24.7 m cargo bay, using two SSME's, and capable of delivering 45,000 kg to orbit. The CE would have an empty weight of 31,750 kg, using the shuttle thrust structure, and be fitted with shuttle engines and computers at the end of their useful lives. Three to four flights per year could be accomplished using the expendable approach, while NASA believed it had a requirement for 10 to 12 per year. Generation 2 would have a new-design recoverable CE, powered by 3 SSME's, and capable of delivering 77,000 kg in a 7.3 m x 29.3 m volume. In early 1989 the study contract was extended by one year, including consideration of use of the Centaur G-Prime from the Titan IV as an upper stage. It was determined that the MPTA-098 structural article built in the 1970's for the SSME development program could be used as the Shuttle-C prototype. At the end of the study NASA decided that the development cost for Shuttle-C would be $ 1.8 billion. The Office for Technology Assessment estimated the cost as only $985 million, a rare case indeed where NASA made a high-ball estimate. Cost per launch would be $424 million for the Generation 1 design, or $9350 per kg. 14 Space Shuttles and 10 Shuttle-C's could be launched per year using existing Kennedy Space Center facilities. However such a rate would quickly exhaust the supply of surplus SSME engines. Therefore new-build engines would have to be purchased at a cost of $38 million each, or a total of $500 million per year. When this cost was taken into consideration, Shuttle-C was more expensive than the USAF Titan IV - therefore, NASA concluded, there was no reason to develop it. The decision was taken in 1990 to cancel Shuttle-C.
LEO Payload: 77,000 kg (169,000 lb) to a 400 km orbit at 28.00 degrees. Flyaway Unit Cost 1985$: 84.970 million. Stage 0. 2 x Shuttle SRB. Gross Mass: 589,670 kg (1,299,990 lb). Empty Mass: 86,183 kg (190,000 lb). Thrust (vac): 11,519.999 kN (2,589,799 lbf). Isp: 269 sec. Burn time: 124 sec. Isp(sl): 237 sec. Diameter: 3.71 m (12.17 ft). Span: 5.10 m (16.70 ft). Length: 38.47 m (126.21 ft). Propellants: Solid. No Engines: 1. Engine: SRB. Other designations: Solid Rocket Booster. Status: In Production. Stage 1. 1 x Shuttle Tank. Gross Mass: 750,975 kg (1,655,616 lb). Empty Mass: 29,930 kg (65,980 lb). Isp: 455 sec. Burn time: 480 sec. Isp(sl): 363 sec. Diameter: 8.40 m (27.50 ft). Span: 8.70 m (28.50 ft). Length: 46.88 m (153.80 ft). Propellants: Lox/LH2. No Engines: 0. Engine: None. Other designations: External Tank. Status: Out of production. Stage 2. 1 x Shuttle C. Gross Mass: 36,360 kg (80,160 lb). Empty Mass: 34,380 kg (75,790 lb). Thrust (vac): 6,834.303 kN (1,536,412 lbf). Isp: 313 sec. Burn time: 120 sec. Diameter: 6.30 m (20.60 ft). Span: 6.30 m (20.60 ft). Length: 21.00 m (68.00 ft). Propellants: N2O4/MMH. No Engines: 2. Engine: OME. Other designations: IHLLV; Interim Heavy Lift Launch Vehicle. Status: Study 1980. Family: orbital launch vehicle, Winged. Country: USA. Engines: OME, None. Stages: Shuttle C stage, Shuttle Tank, SRB. Agency: NASA.